Vision: Color. The dark eye markings act like built-in sunglasses. Feet: Non-retractable claws. Four toes. Height: 12 inches (30 centimeters). Weight: 2 pounds (0.9 kilograms). Light-absorbency: Called the "Solar Panel Of The Animal World," meerkats use their dark-skinned, sparsely furred bellies to warm up. Taxonomy: Members of the mongoose family. Tail: 8 inches (20 centimeters) long and used as a tripod to balance the animal in an upright position. Activity: Diurnal (active during the day). Life span: 12 to 14 years. Society: A group of meerkats, usually five to thirty members, is called a "mob" or a "gang." Dwelling: Grass-lined burrows that are shared with ground squirrels and yellow mongooses. Toilet: Common latrine used by all members. Transience: Mob moves several times annually if food supply is depleted. 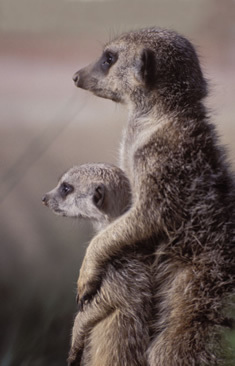 Competitiveness: Meerkats are very territorial and will fiercely defend their home from other meerkat gangs. Guardianship: Meerkats are "snack size" for a number of animals, so one always stands guard while the others forage or nap. Primary predators: Martial eagles and jackals. 911: Various alarm calls indicate different predators. Specialization: Alpha male and female do most of the breeding. Litter size: 2 to 5. Breeding season: October-April in the wild. Year-round in captivity. Helplessness: Born with eyes and ears closed. Sparsely furred. Helpfulness: Various adults will baby-sit the youngsters while the mother feeds. Precociousness: Sexually mature at one year. Diet: Scorpions (meerkats are immune to their venom), beetles, spiders, centipedes, millipedes, worms, crickets (FAST food), small mammals, small reptiles, birds, eggs, tubers and roots. All contents © 2007-2018 by Fellow Earthlings' Wildlife Center, Inc. All rights reserved.